lordxan had the most liked content! Brewer is not a good signing one reason.... Age If we need a second reason, well he is not the player we need and would rather opt for one of our prospects over him, reason, well... Stl let him go for a reason what more needs to be argued? Admittedly I was doubtful Gaudreau would sing, but boy do I like being wrong in this case! Really excited to watch Gaudreau develop. As for Arnold, I had been of the meh, opinion of him...BUT: After doing some research on this guy I'm just as excited about him too. He has shown a consistent ability to adapt and improve, which is really a huge thing some prospects never really find. while I'm not suggesting a No 1 Ctr here, I really think he has potential to push and become a No 2 Ctr, which if he stays here, is saying a ton with our current crop of solid No 2 Ctrs in the likes of Colbourne, Backs, Grandlund etc. This is a really great problem to have moving forward, and I i'm close to being right, could allow Heartly to roll 3 and possibly even 4 lines all the time, which many of the really good teams like Bos, Chi, Stl often do. The key, is having that Ctr depth where your 3rd or 4th line Ctr can easily step in and fill the No 2 slot. I get the feeling Arnold give the Flames this opportunity. Time; however, will tell, but there is a real possibility for it to happen! Well, Ramo has played himself into the to 25 for GAA and SV% for the season. Not bad at all considering the start, this is quite the accomplishment. Hope he picks up 2014/15 season where he ends 2013/14. All and all, he's looking to be a fine replacement for Kipper. This is why he should do the honorable thing and sign with Cgy, this year or next I do not care, if he opts to finish his schooling fine, as long as he signs. Why should he sign, simply because Cgy drafted him and has showed faith and support in him where others had not, such things normally buy long term loyalty to a team, but not always. If JH fails to do the proper thing ans sign with Cgy, then I really hope we get some decent value out of him, if he dose not want to be here then the hell with him. However, I like many Cgy fans, have been waiting to see him in a Cgy uni, there is just so much potential for him to be the net St. Louis/ Fleury of the NHL, possibly even better than either of those two and it would be so great to watch him do that in a Cgy uni! I will say this though,if is mother has so much input in his life, that he is not sure what he wants to do, I have a feeling much of this sty out east crap is from his mother. I really hate when family members but into the hockey player's career (note: career not their life, they are two different things), shades of E. Lindros here? Possibly. 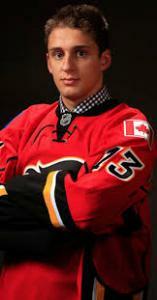 But I do hope he's not a momma's boy and he signs and plays here in Cgy as a super star (well in time). All fine points but: 1. I\d much rather Ortio develop stopping NHL shots vice AHL shots, he needs to be able to stop shots from the likes of Crosby, Ovi, Stamkos etc. Not Morin, Abbott, Hoffman etc. 2. And the reason for point 1 above is simple, remember Irving? He was developed slowly and look how that panned out. OK, in reference to the underlined part: 2011 Baertschi 2012 Jankowski 2013 Monahan 2013 Poirier 2013 Klimchuck And those are only the 1st rounders, look at the just past few years what they got out of later rounds: Selioff W-Spoon Gaudreau Gillies Brodie Now I`m not saying some of the off the chart picks like Poirier and Jankowski were well received by some of the experts and heck even me as a fan was not too sure about them. However, all the above names are developing VERY well, and all should make very solid NHL caliber players. It is even quite possible to see 2-3 star level players out of that batch, now keep in mid I said stars not super-stars in the likes of Crosby, Stamkos, etc. But we are talking the likes of Cammy or Langkow or better which if you have 5 players (all be it in differing roles and skill sets) I think you have a very solid team core just from the 1st round picks alone. Then add some of our later round picks (not all mentioned above) but those 5 above, should all develop into about the same caliber, as of our d mentioned I see them as a Morris or Regher level which, is just fine by me. No, all and all, stand pat, let our draft team do their job with what we have (unless we get knock our socks off offer), they have established them selves well enough in my books and let us be honest, the current draft team look like gods compared to our early 2000 draft team (Fata, Nystrom (though not too bad now by by no means as good as some in his draft class), kobasew, Krahn, Pelech, Irving etc.) Between 2000 - 2010 we really only got luck with Phaneuf and Backlund and those were very strong draft years so it was much harder for them to fail. More over come 2007, the winds of change started with Backlund in term of our draft team, so they were new, learning and still more people being shuffled for a few years there after. Now however, this team is in place for a few years and look at the results just in the past 3 yrs. I would have to say they have proved their worth. Next season is a really good question, personally I'd go with Ramo and Berra combo next season again. Ramo is signed anyway and Berra would need to get locked in to a longer term. Why? Both are or could be trade assets next season with their current progression. On heat I'd do what they are doing here with Ramo and Berra, only Orito and Gillies do the 50/50 split. Why? Well, gives Orito one more year as goalies take more time and this team has ruined top tier goalies in the past so giving them time to develop is best. This only works though if Gillies is signed and can be there to push Orito, I think if there is no competition for Orito then it is a huge waste for him to be on the heat, he needs pressure and after his past few seasons he's been stellar but has had to prove himself, next year he has nothing to prove unless Gillies is there to challenge him for his job. I think next season should pretty much go that way, only I figure Ramo gets a 2 yr extension on his contract and Berra gets a 2-4 yrs deal between 1-2 per season and that would be ideal. Also I figure Orito and Gillies split the duty in Abby next year. The year after that, I figure one of Ramo or Berra is traded Orito comes up and splits the duty with whoever stays (Ramo/Berra). The year after that the remaining guy from Ramo/Berra is traded and Gillies is in with Orito and they battle it out for the next year or two till one or the other takes the job firmly, the other will probably be traded for a top end pick or prospect. No Goaltender is not the area we need to worry about, start of the season yes because both Ramo and Berra were relatively unproven at the NHL level. Now they are proving to be solid NHLers. Just my thoughts on it but our current situation would support this course of action. Well, agreed Ramo earned the next start for sure, but on a side note, both Ramo and Berra have been improving which is a very good thing. They are neck and neck in that area I find, one improves and the other has to catch up which was the intention from the onset of the season so basically Coaching and Mgt achieved that goal! As long as both keep improving, and Heartly is fair with the starts I have no issues. I think both are starting to get adjusted to the NA game and are now working on and starting to see some consistency with their games. At this point I think all flames fans would agree, J Mac is out of the mix, Ramo and Berra are starting to play well out of his max ability range. This has crossed my mind too, good point. Same could be said for whoever is teaching the guys how to do FO's another really bad area for this team. Someone else said it best in here a little while ago: He's an NHL player now, playing with MEN, not BOYS. WJHC is all about boys showing they are better than the other boys and have the possibility of being able to play against men. Simply put, Mony has proven he can play with men, there is NO developmental value to him playing at the WJHC. I'm good with Berra, his foundation is solid always square to the shooters, glove up, has good side to side to side movement, may not be the next Kipper but, he will do just fine. I think he'll be above the likes of Vernon, Turek, Kidd and others we had in the past. Having said this, he should only get better, if he can be leaned on for 50-60 games per season should allow us to phase in the likes of Ortio and later Gilles. A little less throw them to the wolves and pray for the best in net is needed and hopefully Berra can provide this. Also, I do hope this pushes Ramo to be a bit more consistent too. All in all Berra gets a pass grade for now and if he keeps this up. should be an above average NHL starter. K over all I see your point but: Vernon, life time SV% was .890 not much to write home about and just a testament to how strong that team really was in 1989. Never really was a huge fan of Vernon anyway he was just luck to ride a great team that year. As for a SV% close to .900 being stellar, no not in today's NHL, it's probably the minimal bench mark to be considered a starter these days. Take into account the top 30 goalies are all above .900, so by that and considering there are 30 team in the NHL, each team should be looking at the .900 mark for their starting goalie. This just amplifies our current goalie situation both being WELL below .900, not good. Now, to say we need another Kipper, well that is just not reasonable, but Mgt should be looking at this issue harder and looking to give the guys a chance to win, this is not happening when the goalies are letting in softies on a regular basis, no chance to win. Your starter at a minimal needs to stop the easy ones regularly. Not saying playoff here, just allow our young guys to play with some confidence is all, Gotta disagree, Bernier for example went for a 4th, think we could have afforded that. Added, there were many decent (by decent I mean better than J Mac) established Goalies in FA and many went cheap this year. Honestly, it's about time. He may be able to push Ramo to get more consistency to his game, or take the starter job. There is however, the possibility both Berra and Ramo fail, if they do, at least the team will know sooner, rather than later, where we really stand in the intern goalie area and address it. Why is this important? Well,we do have some really good prospects in goal but: 1. They are a few years away 2. they are prospects, nothing saying they will pan out The other reason it's important, is to avoid doing an Edm and just throwing a bunch of skilled kids out on the ice. We need to give our kids a chance very night to win, our goalies are currently failing here. Now, not saying we need a super star, but we do need a decent goalie capable of keeping the SV% above .900 on a regular basis. This would allow for a better assessment of how the team is developing by having a reliable and consistent goalie, then you can say ok D needs work or our offence is weak or what ever. We can't do that right now because our goalies are letting soft goals which are changing the out come of the game vs the actual tem play on the ice. I just hope, if Berra fails, they are willing to entertain a trade or FA to get a decent intern goalie while we wait for our prospects to develop.